The relationship between Scotland and Ireland has always been a close one in many respects including athletics with many Irishmen living and racing in Scotland – such as JJ Barrie and Cyril O’Boyle in the post-war era. During the 30’s such as Hans Noble who was one of a group who came to work in Scotland on the ‘Empress of Britain’, ran over here, then returned to Ireland when the job was done, then returned to work on the Queen Mary. Hans ran for Ireland in the 1933 International in Wales After the War he settled in Scotland. But there was often a problem keeping track of their racing and even their whereabouts! One of the most intriguing careers in this respect was that of PJ McCafferty who ran internationally for Ireland but who also won the SAAA 10 miles championship. This profile is incomplete – we have been unable to track down all his running, or even to know where he was living at any one time. PJ’s brother JJ McCafferty, who was also a very good runner and he features largely in this profile, was the first to come to the notice of the distance running fraternity. He appeared in 1899 when he won the West District cross-country championship while running in the colours of Celtic Harriers, and Colin Shields in ‘Whatever The Weather’ recounts the race: “John McCafferty, 10 mile club champion of the three-year-old Celtic Harriers, won the 7.5 mile race over a difficult course around Hamilton Park Racecourse. He finished in 45 minutes 20 seconds with W Lawson, Whiteinch, runner-up 23 seconds behind. … McCafferty was richly rewarded for his victory, receiving three medals, one from the SCCA, one from Celtic Harriers and one from Mr F Lumley of the well known sports shop.” On 25th November 1899 he ran in the Clydesdale Harriers Open Handicap and Team Race where he finished second to DW Mill who would go on to win the national cross-country championship in two consecutive years. Later that year, he ran in the steeplechase at Parkhead on Monday, 13th August at the Monday supplementary meeting to Celtic FC sports he was entered in the six laps steeplechase where he was unplaced. The first big race of the following winter was on 24th November, 1900, and was the Clydesdale Harriers 7 miles cross-country team and individual race at Scotstoun and it was won by JJ McCafferty (spelled McCaffrey in the Harriers handbook) from Thomas Bennie of Whiteinch Harriers. The West of Scotland Championship was held on 18th February, 1901, and JJ McCaffrey, running for West of Scotland Harriers, won the West of Scotland Championship from his brother PJ McCaffrey (Celtic Harriers Club) by the slender margin of ten yards. (Life gets complicated – Colin Shields, who was meticulous in his research, has the winner as J McCafferty). He did not have it all his own way however since PJ was West District champion in the same year. The question of name spelling keeps coming up with the brothers. We know they were brothers – eg reports on the Junior Championships refer to J McCaffrey leading his brother by ten yards – and that they both ran at different but overlapping periods for Celtic Harriers and West of Scotland Harriers but the same papers spelled the names as both McCaffrey and McCafferty. Alex Wilson, when consulted, about this said that he had checked out the census returns and could not find him in either the 1901 or 1911 census. He may well have been living in Ireland at these times. There was a reference to him living at Tighnabruaich though and Alex suggested that he worked there during the summer. However we will refer to him henceforth as McCafferty for the purposes of this profile. He won the Scottish cross-country championship at Scotstoun on 14th March that year and the ‘Glasgow Herald’ reported as follows: “There was a large attendance of athletes generally and cross-country followers particularly at Scotstoun Showground on Saturday on the occasion of the eighteenth ten miles cross-country race for the championship of Scotland. Eight teams entered and all ran with more or less full teams. Edinburgh Harriers ran 12 but one had as few as three runners and had a correspondingly The course was heavy but the overhead conditions were very pleasant and there was just sufficient nip in the air to cool the competitors somewhat. Racing was keen with the exception of the winner who had an easy victory, winning by fully 150 yards in 63 min 07 sec.” Running in the colours of the West of Scotland team, McCafferty won from J Ranken of Edinburgh Southern Harriers and DW Mill of Greenock Glenpark Harriers, who had won the two previous championships as a member of Clydesdale Harriers. Since he was eligible for the Junior championship, which was run in conjunction with the senior race, McCafferty won both Junior and Senior championships. McCafferty chose to run for Ireland in the first international cross-country championship to be held at Hamilton on 28th March. England were a bit sticky about taking part in such a fixture: first of all they refused to take part because they feared that such a fixture would detract from their own championships and only agreed when they saw that the other countries were determined to go ahead with or without them, and then they insisted that the event take place on the 28th rather than on the 21st (which had been the proposed and agreed date among the others) because their champion, Shrubb, was racing on the Continent on the 21st March. However, the event went ahead, Shrubb won with ease and England won the team race from Ireland and Scotland. McCafferty finished back in twentieth position while J Crosbie of Larkhall was first Scot home in tenth. The report on the race indicates that it was not as good an event as the build-up had led us to believe. Mill had recovered enough to be able to race and made a contest of it for the first eight miles. There were only four runners on the starting line, all from the West of Scotland, and only McCafferty finished, winning the title in 57:07.2. It had been a very good cross-country season with his Irish Junior, Scottish Senior and twentieth in the international and the track season proper was about to start. 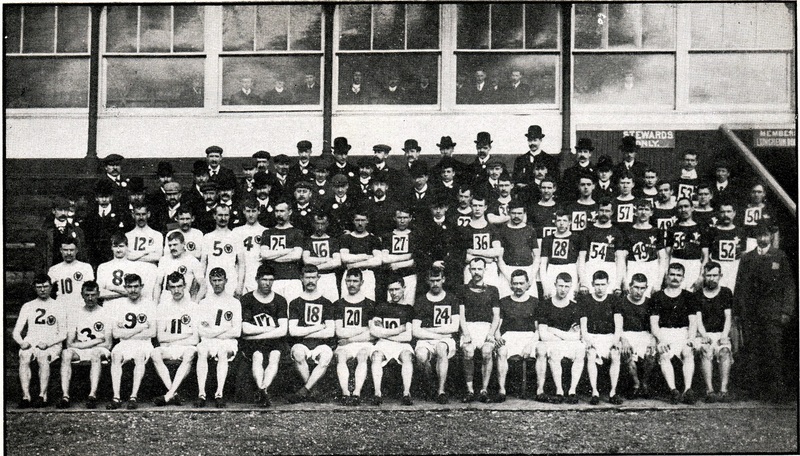 At the start of May, Thursday 14th, the West of Scotland Harriers held a meeting at Ibrox and the ‘Glasgow Herald’ preview said that the two mile match between John McGough, the mile champion, and PJ McCafferty who was so successful last cross-country season would be one of the highlights. Pointing out that the distance was too short for McCafferty and that if McGough were in anything like his normal form, he would win comfortably. Alex Wilson has a profile of McGough on this website with a description of the race which notes that in 1903 that “It wasn’t much of a contest, though, because McCafferty retired at two miles and McGough finished alone. McGough’s time of 20:21.8 was another personal best and brought him to within 11 seconds of the Scottish native record.” Follow the link to the McGough article and the full description of the race. Despite a fairly thorough look through newspaper reports and checks with some well-known historians, McCafferty disappears from the records between 1904 and 1909 when Alex Wilson has tracked him down to finishing sixth in the Powderhall Marathon, and third in 18 miles Strathavon Marathon. He comments: “After his run at Strathaven there was a report in the ‘Hamilton Advertiser’ that a Peter John McCafferty , I quote from my notes “slipped and fell down six or seven steps while running down the stairs at Hamilton Central Station to catch the late train, knocking himself unconscious and sustaining bad cuts”. He was taken to Glasgow Royal Infirmary, but considered well enough to be released next day.” This interest in road running came at a time when the ‘marathon’ was enjoying something of a surge of interest in the country, following the dramatic Olympic marathon the previous year. McCafferty was unplaced in both of these events and his career, in Scotland at least, seems to have ended there. He was clearly a very good runner – he had run in the cross-country international and won the Scottish championships – who was highly rated by the athletics cognoscenti of the time. It would be good to have more information on this athlete, one of the first of our Irish visitors to make his mark in Scotland.